"If you're willing to wait, your work will be great. Be patient and do things right." - "Willing to Wait" from the VeggieTales DVD, Abe & the Amazing Promise. One great aspect of blogging is that you stumble upon products you might not otherwise try. VeggieTales have been around for a number of years - 16 and counting, from my research. I remember visiting a Christian book store a few years after they came out and thinking that the combination of vegetables and Bible stories seemed a little strange. Even after I had kids, I never did give them a chance until I reviewed my first VeggieTales DVD (The Pirates Who Don't Do Anything) with my daughter. She loved it! 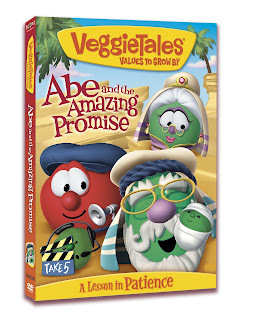 We are now officially VeggieTales fans and are excited to share with you the newest VeggieTales DVD release just out February 7th, 2009: Abe & the Amazing Promise: A Lesson in Patience . The first part of Abe & the Amazing Promise tells the Bible story of Abraham and Sarah's long wait for their promised son. Despite their old age, they learned to be patient, have faith and to wait on God, and miraculously their son Isaac was born. In the VeggieTales version, Bob the Tomato acts as a film director with assistant, Junior the Asparagus in interviewing Abraham (Pa Grape) and Sarah. Junior wants to rush through the production so that he can eat the cookies his mom promised him after he finishes. Through Abraham's story, he learns that "it is not always easy to wait, but God always comes through with his promises." Typical VeggieTales, the story includes a lot of silliness such as the depiction of Ur as a retirement community, images of spitting camels and Abraham contemplating the following names for his son: Larry, Moe, or Shemp. In the middle of the DVD is a silly song sung by Larry the Cucumber entitled, "Sneeze If You Need To!" The second part of the DVD features Blunders in Boo-Boo-Ville, a musical. Jacques (Larry the Cucumber) is an impatient inventor. He doesn't take time to do things right and also doesn't take time to be a good friend to his assistant Maurice (Bob the Tomato). The mayor of Boo-Boo-Ville threatens to cancel the Boo-Boo Bird Festival unless someone can figure out a way to bring the Boo-Boo birds back. Jacques eventually learns to be patient and comes up with a plan to save the festival with the help of his friends. The story includes many great songs, including "Right, Right Now! ", "Hum, Ding, Purr, Whee! ", and "Willing to Wait." The DVD's featured Bible verses are Hebrews 6:15 and Proverbs 19:2. Patience is a hard lesson to learn for kids (and adults), especially in this age of technological advances where everything is delivered instantaneously. Abe & the Amazing Promise delivers a much needed lesson that even though God's time is sometimes different than our time, God always makes good on his promises. My preschool age daughter's favorite part of the DVD is the song "Willing to Wait." The song has very catchy tune, and its message is wonderful. The DVD provides me with a fun, entertaining and creative way to introduce my children to an Old Testament Bible story. And, that is what VeggieTales does best. Thanks to Family Review Network and Big Idea Productions for this review opportunity! Our giveaway ends next Tuesday on 2/17 good luck!